If you’ve ever seen an episode of Cake Boss or Ace of Cakes, you have probably been wowed by the amazing cake creations. The talented people on the show explain how these confections come to life and the work that goes into them. If you’ve decided to take the plunge and order a specialty cake, you’ll run into the one issue the shows don’t cover – cutting the cake. It’s almost a shame to cut up such an amazing cake, but it is cake and it’s meant to be eaten. When it comes down to it, you will need to cut the cake so your guests can enjoy it. Here are some tips for serving your personal designer cake. If you are shop for a gourmet dessert, like a specialty cheesecake, you will be rewarded with simple-to-serve pre-cut slices. These are often professionally separated with tissue, and perfectly portioned. Chances are good that you’ll have to partially disassemble the cake in order to cut it. To do that, you’ll need plenty of space to work in. If your table is large enough, use it. Otherwise, bring an empty table close to the cake and use it to hold cake parts, plates and serving ware. Recruit a friend or two to help pass out the cut pieces so your guests see a smooth, effortless experience, while you work to provide enough pieces that are beautifully presented. If your cake is multi-tiered or has a variety of components on it, separate them. Bakers usually have each tier on a thin piece of cardboard to provide support for the cake. Place each tier or component on a platter or tray so you can handle it apart from the other pieces. Know that some decorations might either not be edible at all or made of material that won’t taste good and are best to only look at. Once you have your cake broken down into manageable parts, it’s time to begin the cutting process. There is no one size recommendation when it comes to cutting cakes and everyone has an opinion. There are a few things to keep in mind when it comes to sizes. Are there other desserts or is the cake immediately following a large meal? In those cases, you’d want to make small to moderate servings. If nothing else, people can always come back for seconds. If you have time to cut and plate all the servings, you can provide small, medium and large servings grouped by size and the guests can choose the size they prefer. Even with custom shaped or carved cakes, you’ll be dealing with either a round or square basic cake shape. 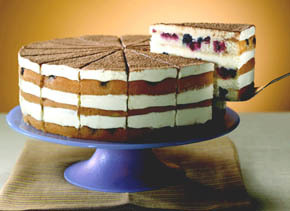 Round cakes tend to have three layers of cake and two of filling. Because of this, they are taller than sheet, or square, cakes. For hungry party-goers, give a generous 2 ½ to 3-inch, pie-shaped cut. For smaller pieces, 1 ½ to 2-inch pieces are reasonable. Any smaller than that and your slices will tend to fall apart. Square cakes are relatively easy to cut and are about half the height of their round counterparts. Larger pieces tend to be about 1 ½ by 2-inch sections and caterers usually serve 1-inch by 2-inch slices. Here is a handy cake cutting guide. To keep your slices clean and sharp, regularly wipe off your knife. You can also run the knife under hot water to heat up the blade. The heat will slightly melt the buttercream or fondant, making nice cuts a snap. Ever hear of the saying “like a hot knife through butter”? It applies to this situation. Even the lightest tasting cake is very heavy, especially when stacked and sculpted. This is why custom cakes usually have some sort of inner support structure. When you’re cutting the cake, be sure to remove the supports before serving the cake to your guests. Nobody wants a piece of PVC or Styrofoam in the middle of their dessert! If you’re unsure about which elements are edible, ask your baker.